PETE BLACK, 21, became the youngest ever winner of the Fish’O’Mania title as celebrated the event’s return to Hayfield Lakes with a commanding performance, winning with a total of 51.35kg, over 12 kilos ahead of his nearest rival. Hailing from King’s Norton, Black works at Foster’s, a Birmingham tackle shop and he will be sure to receive a hero’s welcome when he returns to work on Monday. Fourth after the first weigh in, Black stormed into the lead in the second 30 mins with a big bag and it was a position he maintained throughout the match. 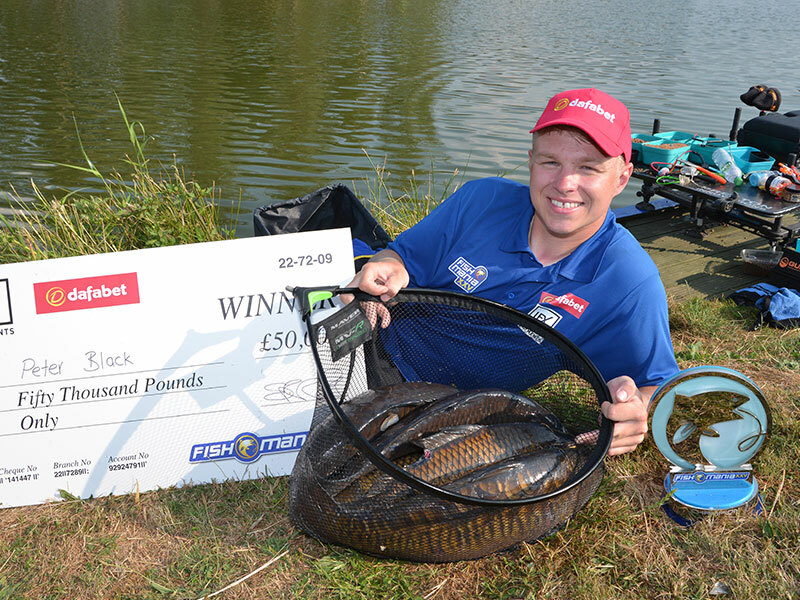 He was challenged at times but kept the fish flowing sufficiently to land the £50,000 prize. He said, “You have to be confident when you’re fishing for a mega amount of money, you can’t sit down on your peg and think, oh I’ve drawn next to so and so and they will beat me. “It is a dream to win Fish‘O’Mania. I have been putting in a lot of hard work in the last few weeks and it has paid off. Mid-match I lost my way a bit – I went on the waggler and only really caught a few. “I said to Adam (his bank runner), if I’m going to win this I am going to carry on catch on the pole and I stayed on that then for the rest of the match. “You have to keep your head, it’s a fishing match at the end of the day. Everybody here is good enough to win so you have to just enjoy the day. In front of a huge crowd, estimated to be around 6,000, second place and a cheque for £10,000 went to Andy Power, repeating his feat of 2017.